Deco Divers is the newest venture for Jake Shekels. Jake, a native Floridian, has SCUBA diving in his blood. He is the grandson of Mike Kevorkian, who founded Tarpoon Skin Diving Center in 1952, and the son of Valerie Kevorkian, owner of Tarpoon Lagoon Dive Center, located in the heart of South Beach. Jake has been managing Tarpoon Lagoon since 2005. He is a NAUI and PADI certified Instructor and is an avid recreational diver himself. After diving off of countless boats in various cities and countries, Jake had a clear idea of what he wanted to see out of a dive boat so when the opportunity arose for him to have his own boat, Jake jumped aboard! Jake started Deco Divers in January 2015 and wants nothing more than to provide first class service to all divers that come to see what diving in Miami has to offer. Our boat is a 46’ Newton Dive Special named the Big Com Ocean. With room for __ divers on the deck, plus seating upstairs, the Big Com Ocean is the ideal dive boat. Our dive boat has a full dive platform for easy water access as well as two Christmas Tree ladders that make getting back on board a breeze! We have 2 fresh water showers and have mask defogger, shampoo and conditioner on board. We also have plenty of ice cold drinking water and snacks for our divers and snorkelers. Most important of all, our dive boat has a wonderful, knowledgeable captain and crew. Our captains and crew are onboard to ensure the safety and enjoyment of all of our passengers. The Deco Divers team is dedicated to providing a great experience for all levels of divers and snorkelers. We are professional, safe, and have a deep respect and love for the ocean and all of its creatures. Whether you want to Discover Scuba, get certified, hunt lobster, or dive a legendary Miami deep wreck, our team of experts are here to make it happen for you. Captain Ani Gonzalez is a native of Miami (raised in Hialeah) and has had a love affair with the ocean since her parents took her for her first dip at the beach in Key Biscayne at the age of 1. In 1985, at the age of 17, Ani earned her NAUI Open Water certification by Instructor Rick Smith and began diving on RJ Diving Ventures. In 1996 she attained her Divemaster rating and shortly thereafter became PADI Instructor #99376. 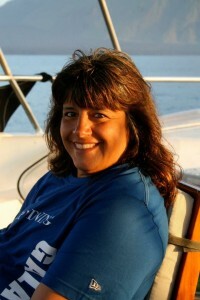 In 2009, Ani earned the PADI Master Scuba Diver Trainer rating. Her passion for diving led her to become a State of Florida certified bridge inspector for the FDOT where she would inspect all the bridges in Miami-Dade and Monroe Counties, above and below water. In 2012 another goal was attained by earning a Commercial Scuba Diver rating through the Diver Certification Board of Canada on Vancouver Island, BC. During the last 18 years her love of diving has led her to be involved with a local dive shop as an instructor and its dive travel coordinator / instructor at Ocean Safari Diving Adventures. Dive travel is another passion that helps Ani share her love of the ocean with so many. Capt. Ani holds a 100 ton USCG Captain’s license, which she puts to great use as Deco Diver’s Captain / Manager on the Big-Com!